7 July 2015 – The age old saying “Fail to prepare, prepare to fail” comes to the fore when you are in the world of sports. While Shanti Pereira made herself comfortable in the new National Stadium and Soh Rui Yong cheekily glanced at his competitor before zooming into the golden marathon skyline, there was a group of people quietly running their own marathon around the Sports Hub arena. A slew of nine medals – 3 gold, 3 silver and 3 bronze, not to mention the many national records and personal bests that were achieved, it is easy to forget the work that goes behind the scenes but our curious onlooker Kelvin Leong takes a look at this group of sports enthusiasts who committed themselves to making this Southeast Asian (SEA) Games track and field journey a memorable one for Singapore. From new sprint and relay coach Luis Cunha’s minute tweaks that helped the sprinters improve and shatter their own records, to Mardiah Khir’s never tiring efforts to ensure everything in the office backend was smooth as silk, it all boiled down to the finer details that made a difference when the showpiece event came rolling into town. 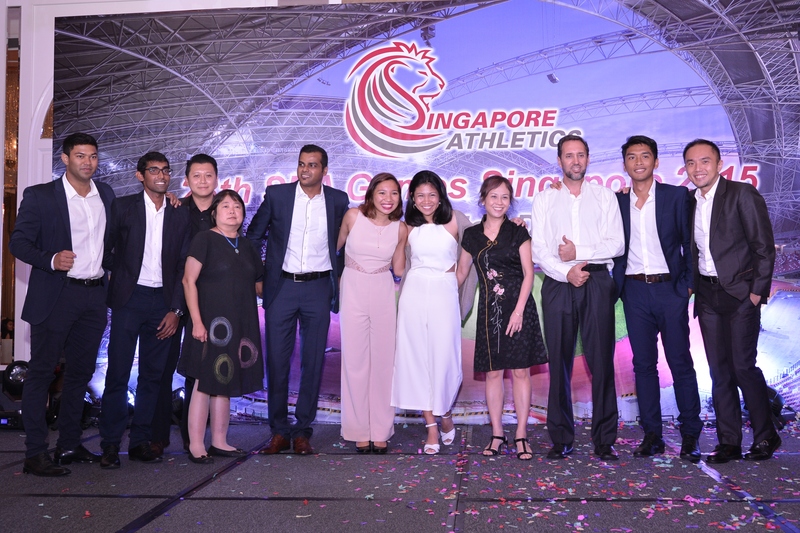 The opening of the ‘Home of Athletics’ and the SEA Games jersey presentation event epitomised the new-look SA team; where innovative ideas and willingness to go the extra mile were the key ingredients. Legends like Mr C. Kunalan, Glory Barnabas and our Masters’ athletes were all present during these significant events to not only share their wealth of knowledge with the youngsters but because they too are a huge part of our family. SA’s new recruit, Shamsul Ilham was tasked with his first project and when he mooted the idea of a presentation ceremony, he went on to undertake the entire project and made it a roaring success. While he organised the jersey presentation event, the rest of SA were also quick to chip in with other initiatives like remembering the late Zaki Sapari, who would have loved to compete at this Games. Zaki’s parents, Mr. Sapari Mingan and Ms Sapiah Aziz were agreeable to the idea of a simple video to remember their son, and were quick to offer their well wishes for the Team Singapore athletes. The video received positive feedback and showcased the togetherness of SA, where the past, present and future could now sit in one room, to work together for a common cause. And when 7th June came, Singapore Athletics was ready to put on a show. First up was Sports Development Manager, Morales Menon, who took on the role of Assistant Team Manager and despite his inexperience in the role, he soldiered on and became not just an administrator for the team but also a friend and confidante to the athletes. 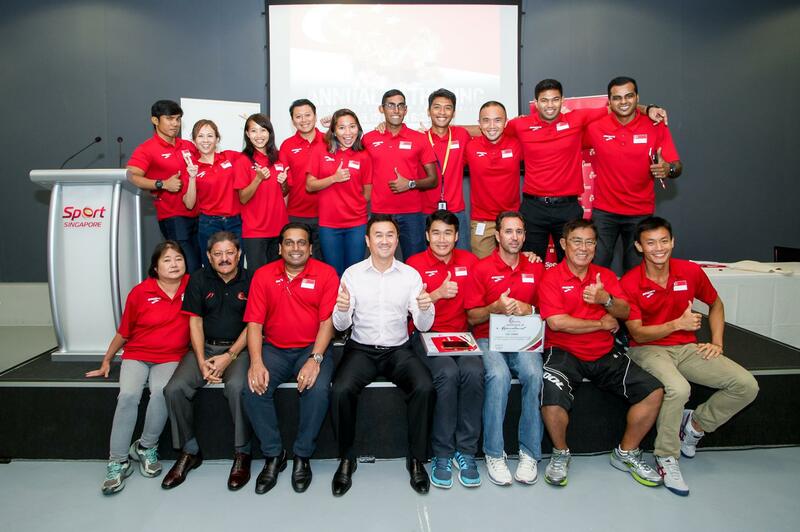 He quipped: “73 Athletes, 11 officials, 84 in the largest contingent to represent Team Singapore. It is one of the most stressful appointments but the team did a fantastic job. 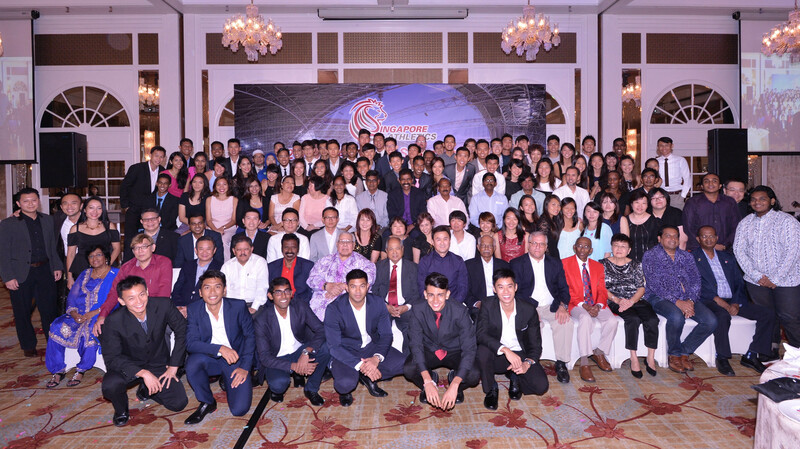 I have to thank our President Mr Tang Weng Fei, ExCo members, Damon Yong and our entire Athletic secretariat team. We are the team behind the team, and I am grateful for having such a strong Secretariat supporting us throughout. 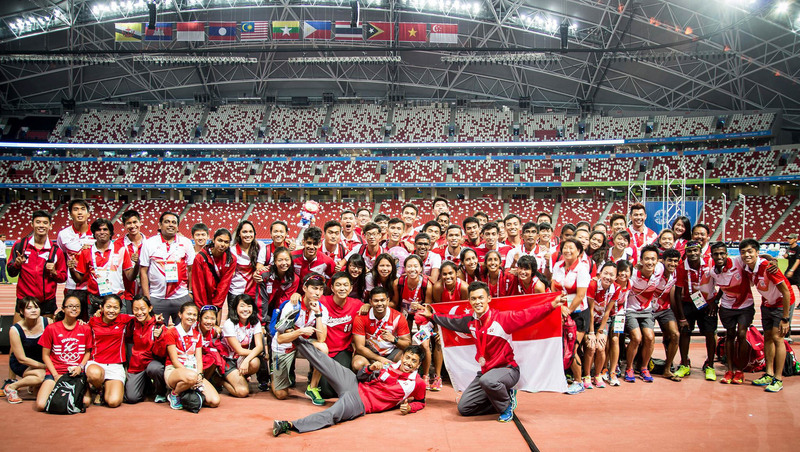 While Morales ensured the athletes were ready to roll, Nelson Tan and the competitions team were working round the clock, making sure that the competitions venue, equipment and manpower issues were ironed out before Singapore welcomed our ASEAN neighbours into the National Stadium. It was then down to the baby of the team Carissa Ashley Yow, an intern who decided to make her role a permanent one, who took on the role of SA’s SEA Games media relations contact person. An athlete herself, she worked her socks off to learn the ropes of sports administration, fronting media queries and was an ever-present during media sessions with the athletes to ensure the stories were accurate and relevant. She exclaimed: “It has been very refreshing to see how the SA secretariat team has come together to support our athletes. I learned to understand what the media needed and jumped at the chance to help my colleagues on the ground at the Games. The proud moment hit me during the appreciation dinner, which made it all worthwhile. With Carissa busying herself on the media front, it was down to the quiet and unassuming Shalindran Sathiyanesan, a former 400m sprinter who traded his spikes to become part of the SA Secretriat. 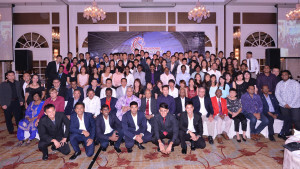 Tasked as project IC for the appreciation dinner to celebrate the track and field achievements at the Games, Shalindran steadied on and created a night to remember at the InterContinental Hotel. Not only did he nail it with a perfect night of celebrations, together with the SA team, they came up with the brilliant idea of surprising the athletes with a door gift that epitomised the vibrancy and team spirit within the SA family. “The SEA Games was a big eye opener for me. The way things were organized and put in place is different from what the team would normally do. And of course, the appreciation dinner was like a perfect summary to bring the curtains down for what was a memorable experience that will stay with me for a long time to come.” added Shalindran. Behind every good team, there is always a good leader. And that is exactly what Damon Yong brought to the table. His move from the environmental industry back to sports is in his own words “a coming home of sorts”. And it didn’t take long for the man to imprint his methods onto a team of strong cast members who were already in full swing. “I have definitely returned to the sports industry at an exciting time! It is not just because of the recently concluded SEA Games Singapore 2015 but also at an opportune time when a mega infrastructure like the Singapore Sports Hub is available for various sports and recreational uses. So with everyone closing the SEA Games chapter with a smile on their faces, the SA secretariat will now recharge their batteries and prepare for the next chapter of events like the Asean Para Games in December 2015 and the Asia Masters Championships in May 2016.